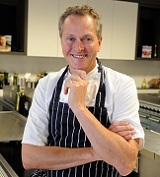 A celebrity chef will be among the line-up at a regional daily’s annual ball. Michelin-star chef Nick Nairn, pictured left, will be helping to prepare the banquet for the Energy Ball, held each year by The Press and Journal in Aberdeen. The event celebrates the successes of the oil and gas sector in the North of Scotland and will take place at the Aberdeen Exhibition and Conference Centre on 3 October. Editor-in-chief Damian Bates said: “A prestigious event like this deserves the kind of specialist banquet Nick and the team at the venue are conjuring up. Around 1,400 guests are expected to attend the Energy Ball, which will have a gold theme to celebrate the 50th anniversary of the oil and gas industry in the North of Scotland. A former regional press journalist who set up a hyperlocal blog has been given a civic award. Ben Black, who used to work at the South Wales Argus, has edited Cwmbran Life since 2011 and has now been recognised by Torfaen County Borough Council. Torfaen mayor Giles Davies has presented Ben with the Civic Testimonial Award for his work on the blog, which features news, human interest stories and entertainment. The mayor said: “I think it’s really good how Ben gets the news out to the residents of Torfaen about what’s happening in the area. 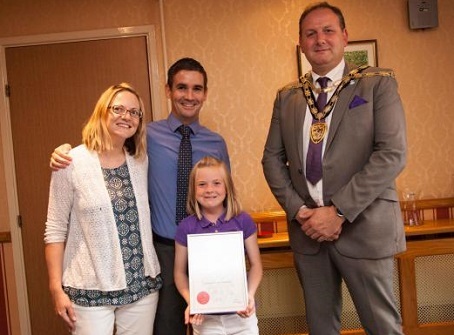 Ben Black is pictured with wife Alison and daughter Mollie receiving his award from Mayor Giles Davies. A journalist who joined a weekly newspaper as an teenage apprentice has passed to become a trainee. Hayley Anderson, 20, joined Archant title the Romford Recorder in August 2013 as one of the first to take part in a new apprenticeship scheme launched by the National Council for the Training of Journalists. The apprenticeship scheme saw her spend four days at the Romford Recorder’s Ilford office and spend each Friday in the classroom at Lambeth College. Editor Chris Carter said: “Hayley’s the life and soul of our news team, always willing to try anything and keen to learn. She has applied herself to her apprenticeship, flying through her exams and earning praise from her tutors. Editors from regional publisher Archant have shared their knowledge with more than 20 Saudi Arabian students from universities across the UK. The students who hope to work in the energy sector visited the Eastern Daily Press’ headquarters as part of a five-week scholarship teaching them how to be business leaders of the future. The talk at the newspaper offices was led by Tim Williams, managing editor at the EDP and Norwich Evening News, and Archant publishing editor Shaun Lowthorpe. The visit was part of the students’ training in media and crisis management.